As Paramount's CinemaCon presentation was coming to a close, the studio confirmed a number of movies that are on the studio's expansive production slate, including the long-gestating Coming to America 2 starring Eddie Murphy, which will be called Coming 2 America, and the expected follow-up of the studio's current low-budget hit A Quiet Place 2. Other projects confirmed during a montage of various movie logos include World War Z 2, the long-gestating Dungeons & Dragons, Gemini Man, which had been in development at Disney back in the 1990s, Terminator 6, Top Gun 2, Sonic the Hedgehog, What Men Want and Micronauts, just to name a few. Here's what Paramount's Jim Gianapoulos told exhibitors about the studio's recent box office woes, and how they plan on turning things around. "It's no secret we've had some difficult years at the box office. We're laying the foundation...to deliver to you films for every possible audience for years to come." We first heard about Coming 2 America last March, when comedian Eddie Murphy's now-deactivated Twitter account sent out a very cryptic tweet that indicated Coming to America 2 was happening, and that Murphy himself was writing the script. The actor's tweet included a photo of his Coming to America co-star Vanessa Bell Calloway, who played Princess Imani in the sequel, the woman Murphy's character Akeem was intended to marry, before he set off to America to find his true queen. Calloway revealed that the tweet was the first she had heard of a sequel, adding that while she would be interested in returning, she thought that Murphy might have been hacked. It was later confirmed that a Coming 2 America sequel is happening, with Paramount bringing back original writers Barry Blaustein and David Sheffield to work on the script, and the last we heard about the project was back in September, when Snatched director Jonathan Levine came aboard to direct. That report also revealed that Black-ish creator Kenya Barris had been brought on to rewrite, although it wasn't known if Barris was re-working Blaustein and Sheffield's draft, or if he's starting from scratch. 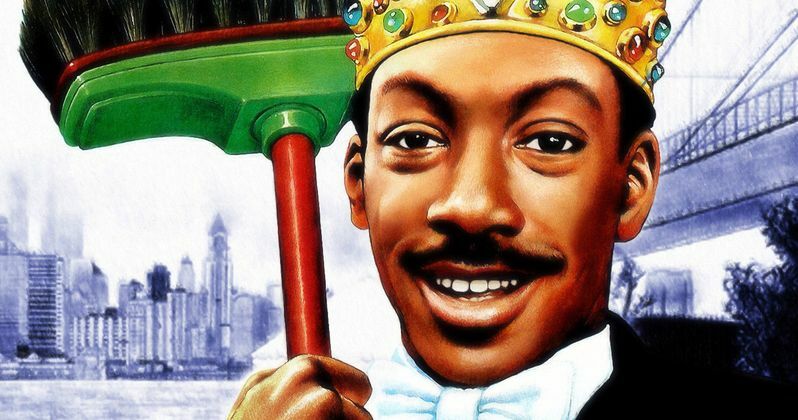 Coming To America hit theaters in 1988, at the height of Eddie Murphy's popularity. The story followed his character Prince Akeem, of the affluent African nation of Zumunda, who learns he has had a bride chosen for him, the aforementioned Princess Imani. Having never met this woman, he devises a plan, telling his father that he wishes to "sow his royal oats" in America, as he sets off on a trip with his servant Semmi (Arsenio Hall). The trip is a ruse, though, with Akeem telling Semmi that he intends to find his bride there, as they journey to Queens, New York, where he falls in love with Lisa McDowell (Shari Headley). Coming to America earned $128.1 million during its box office run in 1988, the third highest-grossing movie of that year behind Who Framed Roger Rabbit? ($156.4 million) and Best Picture winner Rain Man ($172.8 million). There is no indication when production may begin on his sequel, or when Paramount may release the movie. You can read more on Paramount's CinemaCon presentation at Variety.